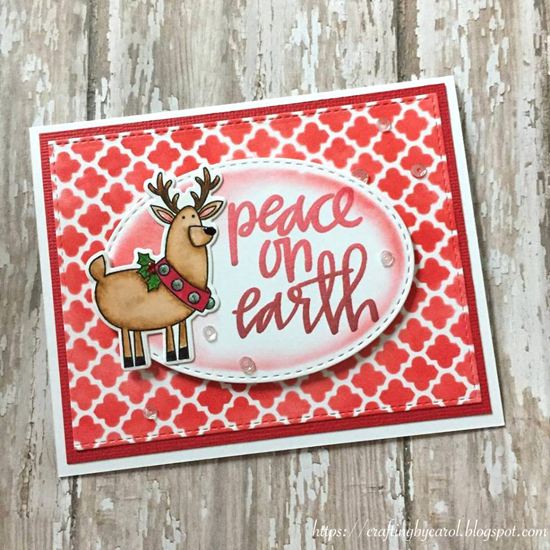 Carol is celebrating the season with this cute card featuring the Merry Everything stamp set and Die-namics and a cool background panel that she created with the Moroccan Lattice stencil. The sentiment from the Hand-Lettered Christmas stamp set is the perfect finishing touch! Social Media Maven Erica Hernandez spotted this spectacular card from Amy Lee! 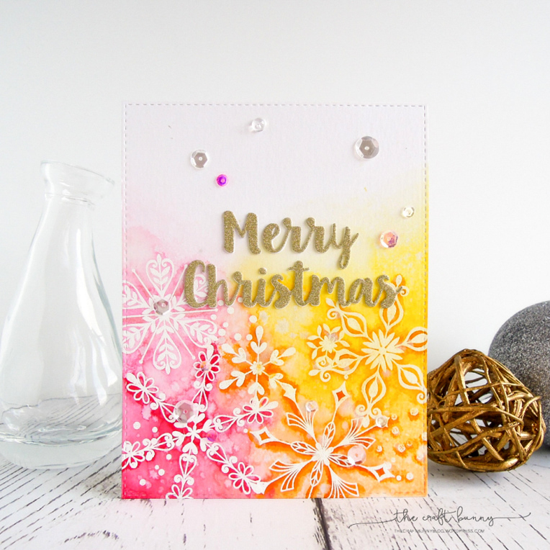 With the help of the Simply Snowflakes stamp set and Merry Christmas Die-namics, Amy created an artistic and eye-catching holiday design. Rachel's card is simple and lovely all at once. 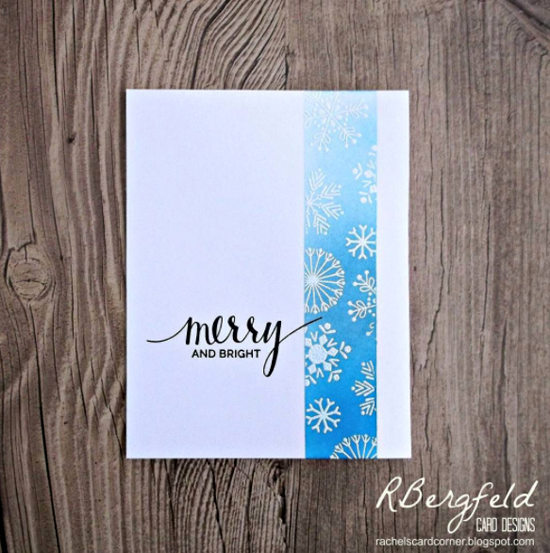 All of that wonderful white space draws the eye to the strip of snowflakes she stamped using the Snowflake Flurry stamp set. And the sentiment from the Hand Lettered Holiday stamp set in crisp black is positioned perfectly using the rule of thirds. Well played, Rachel! I just LOVE the colors that Cheryl chose for this festive card. 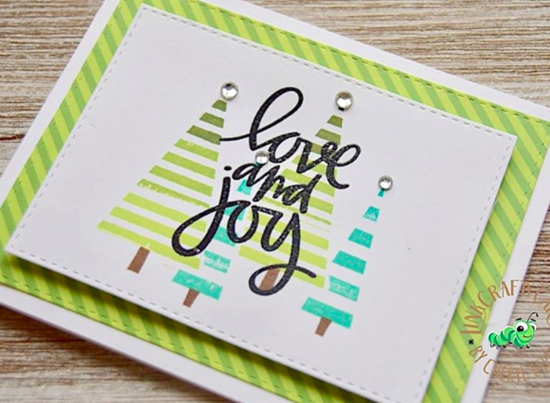 Stamping the trees in varying shades of green and topping it off with a crisp sentiment is a wonderful way to mass produce your Christmas greetings. And the striped patterned paper at an angle gives the card a special feel without a lot of work! Tricia created a stack of pretty gift tags using our Hand-Lettered Christmas stamp set and the Pierced Traditional Tag STAX, Stitched Scallop Basic Edges, and Tag Builder Blueprints 4 Die-namics. 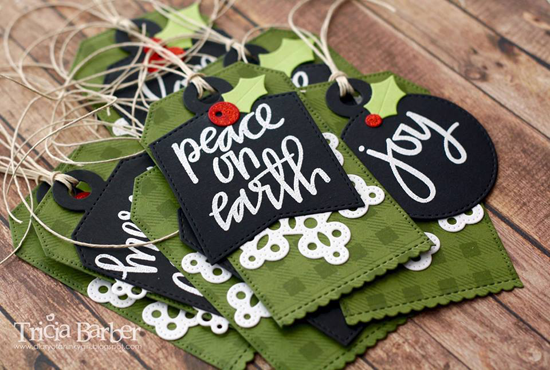 These tags will be treasured as much as the gifts they accompany! Thanks for using MFT, ladies! You've left us inspired, and that's what it's all about! See you tomorrow for another great Sketch Challenge, and look for the next MFT Color Challenge this Thursday, December 8th.